Fishing for steelhead in the winter can be quite challenging. It’s cold, river banks are icy, and gin clear conditions make fishing this time of year quite difficult. 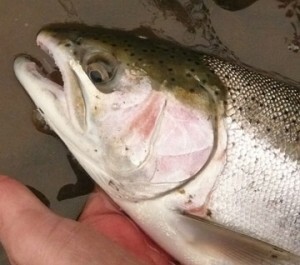 Steelhead are also less active and not overly aggressive. 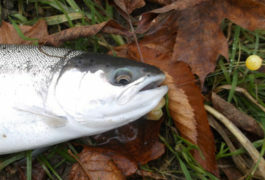 Winter trout will hold in the deeper pools in areas with minimal current so they don’t expend any excess energy. They will also sit tight to bottom or under cover. This time of year slow your presentation down, use light line and just enough weight to allow your bait to gently bounce along the bottom. Pay particular attention to your float as the slightest movement could be a strike. 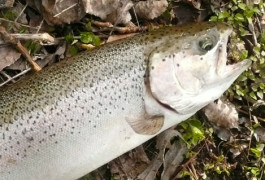 Dress warm during this time of year, as it’s easy to get uncomfortable standing on the banks of a frozen river, the upside, you will find yourself fishing for less pressured trout as you may be the only angler on the river. Proper footwear with good traction is also a must, since creek and river banks can be extremely slippery and icy during the winter months. You also need to take extra care with your equipment, as one of the most frustrating problems steelheading during the winter is the guides of your rod icing up. Coat the guides with wax or vaseline prior to every outing to reduce the icing. Floats and leaders also have a tendency to ice up and this will greatly effect your drift, so stop and de-ice your float and line often. Also take extra care when choosing your drift locations, the edges of ice sheets can cut your line when you hook a trout and it begins to swim under the ice. An additional challenge when fishing for winter steelhead. Best baits for winter steelhead are small spawn sacs in natural colours, beads, and egg imitation flies. 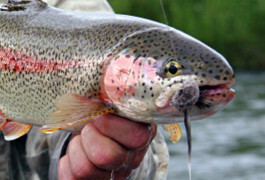 Streamers can also be very effective if the trout are feeding on minnows. Woolly buggers and stoneflies have also been known to work, since winter trout can be very finicky. So when the temperatures start to drop, don’t put your steelhead gear away, give winter steelheading a try. Find a nice quiet stretch of river, enjoy the winter scenery and just be patient. You will be rewarded.